This weekend has been devoted to cleaning up after a few weeks of teaching/travel. Unpacking and setting things into piles was about as far as I got…I still need to organize samples into the various classes and put them away. I can only take so much of that, so I took a break to sew together the Duxbury Point Pullover that I have been knitting for Bill. 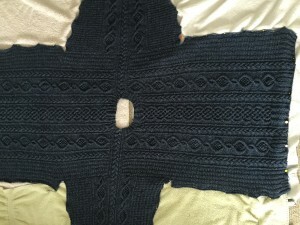 I left it blocking before leaving for Madrona, but now it is all finished! I plan to get photos of it this afternoon if I can pin down Bill or William to model it for me. I also am cleaning up the blog. I have been getting about 25-30 spam comments every day, and my phone is always pinging to tell me about it. A few months ago I had a “re-direct worm” which caused all sorts of havoc. I know folks are reading the blog, because I see the stats – but commenting isn’t popular, so I have removed the comment option from the posts. You can always reach me by e-mail, and I am always happy to interact with you. The spammers…not so much. So, bye-bye spam! In really wonderful news, I just heard that a student I met at Stitches West just had her baby! Welcome to the world, Amelia Rose. You have chosen your mother and grandma wisely, and I have high hopes for your future. I just heard that Jennifer (on the left) gave birth to a healthy baby girl, Amelia Rose. That is her proud gramma, Debra, on the right. 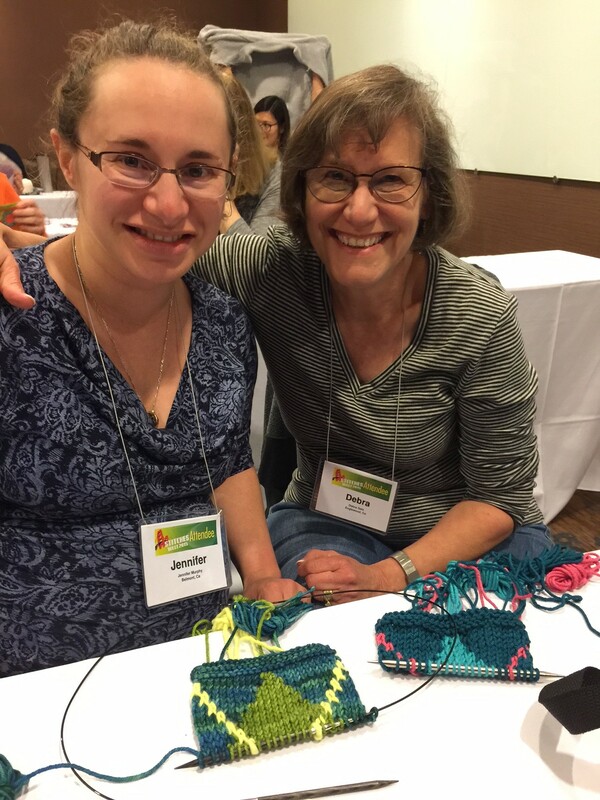 I loved meeting this mother/daughter team at Stitches West, and wish them and Amelia all happiness!